1 How to Wax and Polish Furniture in the Right Way? Waxing the wood furniture is a common thing for not only the woodworking enthusiasts but also the sincere homeowners. Regular waxing and polishing the furniture make the finish more durable for the long run. Also, the better polish of the finish makes better appearances. The wax makes the wooden furniture sustainable from scratches and stains. Also, it protects the wood from different insects like termites, beetles and carpenter ants. How to Wax and Polish Furniture in the Right Way? 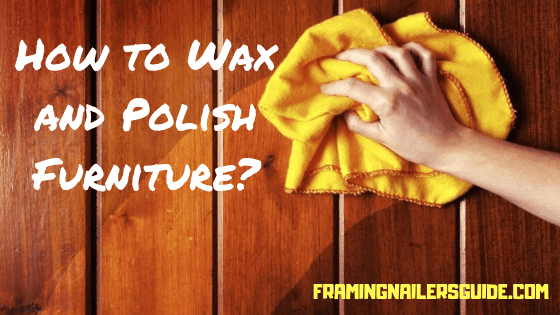 Having the perfect wax and polish to give the best finishing touch to your furniture can be a little tricky. Especially, without proper guidance. Here are some essential tips and guide you can follow. For a good wax finish, use nothing but a paste wax. These items commonly available in grocery stores are satisfactory. But there are carnauba-type waxes which you can use for better woodworking finishes. These items are standard for the enthusiasts for different woodworking projects with tools, and you can typically buy these items in furniture, hardware, or paint stores. Some waxes come in yellow only, while others are brown, reddish-brown, and red, to blend with different woods. Although wax can be used on bare wood or over the stain, best results are obtained if the work is first coated with shellac, varnish, or lacquer. Several coats of wax are necessary on a new surface. Our advice is, you shouldn’t use wax as the finish coat. It is better as the extra protective layer over the sealer. The sealer is the primary layer over the finishes steps after the cutting and joining of wood parts into the shape of the furniture. Using the shellac, or lacquer makes the surface smooth. It creates the base of the polishing wax layers. Now you can apply the first coat of Wax. Before applying the first coat of wax, you should check the furniture for dust and any other dirt. Take a clean cloth and rub it on the furniture to clean the debris. Then place a small amount of wax between several layers of cheesecloth and apply it with a circular motion. This application through a close-grained cloth prevents lumps of wax from being used. Never, under any circumstances, “pile up” the wax by applying too much for it will be almost impossible to rub it out to a smooth satin finish. Allow the wax about 10 minutes’ drying time, then rub briskly with a soft cloth. Using first a rotary motion, and then long strokes with the grain. You should wait to dry it for at least 1 hour. Then, you can apply a second coat the same way. The heavier the wax, the more effort is you need to give to bring it to a real polish. You should rub-dry the first coat. The finish is fragile at this stage, and the water or another lubricant could quickly get under the surface. You should use fine finishing sandpaper for better performance. The standard sheet, if not used on a sanding block, may be torn into eight pieces for this work. Before using. Rub the pieces of new abrasive paper together lightly to remove any long teeth. Rubbing should be done with the grain wherever possible when cross rubbing is necessary for hard to get places. It should be done first, and the marks then smoothed out by sanding with the grain. If you are using a very heavy paste, scrub the surface with a brush, shoe shining fashion, before starting the rag polishing. You need hard and vigorous rubbing in this situation. For a good polish, you have to avoid easy, quick rub. Put more effort. If working on a flat surface, you can get a good polish by placing a brick inside the cloth. An electric polisher can make easy work of many waxed surfaces. However, when using an electric polisher, be sure to tuck the bonnet strings underneath. On turnings, apply the paste wax with a cloth. Then, to polish, wrap a clean, soft fabric around the work and pull it back and forth. As a final test, try to make a thumbprint on the polished surface. If it can be seen, rub briskly with the thick cloth until the print disappears. Retest the surface in the same manner and continue rubbing until the thumbprint test proves harmful. Each surface should have an overall luster with no dull spots. It will be brighter from time to time by rubbing first with the soft cloth, then with a hard one, without the addition of new wax. Very often a thin coat of hard wax can be applied to a varnished surface after it has been rubbed with a pumice stone. Apply very little wax at any one time and polish it thoroughly. Or else the surface will have a greasy appearance and will show finger marks. Times, using the fret or coping saws leave marks on the wood in a way that are seen after coating. To make it vanished, you need better polish. You can use the pumice for the final touch on polishing the furniture. Many use pumice with water or oil, or both, as the lubricant. Water rubbing is faster, cleaner, and leaves a brighter gloss surface, although it requires closer inspection and better judgment during use than with oil rubbing. Oil polished the surface as a final operation. You don’t need further polishing with rottenstone. It is because the gloss will be high enough if you are careful with using the pumice. The wax finish will not withstand water or excessive heat. So, it should not be used where these elements are likely to be encountered. To have better working experience, use the right items and fresh wax. With the guide, waxing will be more comfortable. And with experience, it will be mastered. So, enjoy your woodworking project by doing it on a regular basis. How to clean a carburetor on a lawn mower without removing it? Different Types of Air Compressors: How to Use Them? Copyright © 2019 | FramingNailersGuide is a participant in the Amazon Services LLC Associates Program, an affiliate advertising program designed to provide a means for sites to earn advertising fees by advertising and linking to Amazon.com. *Amazon and the Amazon logo are trademarks of Amazon.com, Inc., or its affiliates.